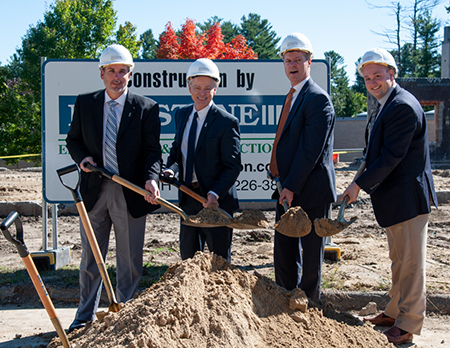 Shown at the groundbreaking for the new Warde Independent Living facility on Catholic Charities New Hampshire’s Warde Health Center campus in Windham are|! !| from left: David Hildenbrand|! !| chief financial officer|! !| Catholic Charities; Alain Bernard|! !| assistant vice president of healthcare services|! !| Catholic Charities; Thomas Blonski|! !| CEO of Catholic Charities New Hampshire; and Bret Pomeroy|! !| administrator of the Warde Rehabilitation and Nursing Center. The new 38|! !|000 square-foot independent will be connected to the Warde Rehabilitation and Nursing Center. HarborOne Foundation, the charitable arm of HarborOne Mortgage, recently donated $5,000 to NeighborWorks Southern New Hampshire to support homeownership education and counseling services offered by the HOMEteam program, a collaboration between NeighborWorks Southern New Hampshire, CATCH Neighborhood Housing and Lakes Region Community Developers that offers homeownership and financial literacy education and counseling services. Londonderry-based Berkshire Hathaway HomeServices Verani Realty has taken up a food and monetary collection to aid residents affected by the recent gas line explosions in the towns of Andover, North Andover and Lawrence in Massachusetts. Verani has a location in North Andover. In addition, Verani agents have reached out to clients and fellow brokers to join them in volunteering at Lazarus House in Lawrence. Great NH Restaurantshas completed a makeover of its former Cactus Jack’s Southwest Grill on South Willow Street in Manchester, remaking it into CJ’s West Grill, offering an “Americana” menu and décor. The 10-day renovation included installing new clapboard, stone and paint, a revamped parking lot and entrance as well as new carpet, new lighting and updated chairs and booths. The 2,400-square-foot building at 289 S. Mammoth Rd. in Manchester was recently sold by Foshe Properties of Manchester to Denise Ryan of Londonderry. According to the Registry of Deeds, sale price was $205,000. Tom Dickson of Stebbins Commercial Properties represented Foshe and Crystal Ashman of Coldwell Banker Classic Realty represented the buyer in the transaction. Chris Wellington of Manchester has been hired as director of housing development and operations at Families in Transition-New Horizons. 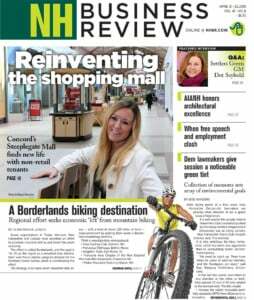 The goal of the new position is to work on building affordable rental housing with wraparound supportive services necessary to help residents reintegrate into the community, FIT-NH said. Wellington most recently worked as business development/project management officer of the Capital Regional Development Council. Before that, he was CEO of the Grafton Regional Development Corp. The 7,818-square-foot building at 155 Dow St., Manchester, was recently sold by FJC LLC of Manchester to RNRS LLC of Nashua. Mike Reed of Stebbins Commercial Properties represented the seller, and Miri Shpindler of KW Commercial Realty represented buyer in the transaction. According to the Registry of Deeds, sale price was $665,000. Prolman Realty Inc. has announced the sale of 52-54 Nashua St., Milford, to KSH Realty LLC. Seller of the 10,000-square-foot property – which was most recently the offices of McBriarty Insurance, was CHERB LLC. Lisa Ferrariand Mark Prolmanof Prolman Realty represented the seller.